UT Southwestern Medical Center researchers have used precision editing of the bacterial populations in the gut to prevent or reduce the severity of inflammation in a mouse model of colitis. The potential strategy - which targets metabolic pathways that are active only during intestinal inflammation - prevented or reduced inflammation in a mouse model of colitis while exerting no obvious effect in control animals with healthy, balanced bacterial populations, said Dr. Sebastian Winter, Assistant Professor of Microbiology and co-corresponding author of the study published online today in Nature. "Our results provide a conceptual framework for precisely altering the bacterial species that line the gut in order to reduce the inflammation associated with the uncontrolled proliferation of bacteria seen in colitis and other forms of inflammatory bowel disease [IBD]," he said. "We stress that this is a proof-of-concept study in which a form of tungsten, a heavy metal that is dangerous in high doses, was used. It is never safe to ingest heavy metals. Now that we have a drug target [the bacterial pathway], our goal is to find a safe therapy that exerts a similar effect," added Dr. Winter, a W.W. Caruth, Jr. Scholar in Biomedical Research at UT Southwestern. Like plants in a garden, the diverse populations of microbes that normally line the intestinal tract, called the microbiota, are essential to human health. They aid in digestion, educate the immune system, and fend off infections. However, when the microbial populations become unbalanced, these otherwise beneficial bacteria become a liability, similar to garden plants that become invasive and push out competing species, he explained. One of the main hurdles in understanding the biology of the gut microbiota is its vast diversity. In humans, hundreds of different species of bacteria are found in the intestinal tract, and the composition of species varies remarkably between individuals. Changes in the composition of the gut microbiota are seen in many human diseases such IBD, a chronic, lifelong inflammatory disorder that includes Crohn's disease and ulcerative colitis. The Centers for Disease Control and Prevention estimates that at least 1 million adults in the United States are affected by IBD. The condition currently has no cure or prevention. Changes in the gut microbiota also occur in Type 2 diabetes, colon cancer, HIV-related intestinal disease, and the necrotizing enterocolitis seen in certain preterm infants, Dr. Winter said. Some of the bacteria in the gut microbiota that are linked to inflammatory diseases are those in the Enterobacteriaceae family. Members of that family, including nonpathogenic E. coli (Escherichia coli), are present in small numbers in the healthy gut and protect against infection with pathogens such as Salmonella, a common cause of food poisoning. However, in IBD patients and in mouse models of colitis, Enterobacteriaceae species grow uncontrollably, said Dr. Wenhan Zhu, co-lead author and a postdoctoral researcher in the Winter laboratory. In recent work published in Cell Host & Microbe, the Winter laboratory reported that the way members of the Enterobacteriaceae family generate cellular energy for growth and obtain nutrients differs from other gut bacteria. They appear to use unique metabolic tricks to fuel their overgrowth and to push out competing beneficial gut bacteria during illness. "These pathways are unique in the sense that they are only present in certain bacteria and only function during gut inflammation. That situation presented an opportunity for rational design of prevention and treatment strategies for conditions related to gut inflammation, such as IBD," Dr. Winter explained. That observation led to the current study in Nature, which used a form of the heavy metal tungsten to inhibit the pathogen's metabolic tricks. "The overall idea is that the tungsten threw a wrench into the way Enterobacteriaceae produce energy, slowing the growth of the pathogenic bacteria during flares of inflammation," said Dr. Zhu. The researchers found that tungsten is taken up by bacteria and inadvertently incorporated into an important bacterial cofactor. The resulting poisoned cofactor does not function properly and derails the ability of Enterobacteriaceae to generate energy in the inflamed gut. In mouse models, oral administration of tungstate, a soluble tungsten salt, in the drinking water selectively prevented the bloom of Enterobacteriaceae in the gut, they said. Nearby beneficial bacteria were unaffected, apparently because their energy-generating metabolism does not rely on that particular cofactor. "It is worth noting that our strategy only inhibits the bloom of Enterobacteriaceae during intestinal inflammation without getting rid of them entirely. This finding is important because in the proper ratios, Enterobacteriaceae also fulfill the role of resisting colonization by bacterial pathogens," Dr. Winter said. "Therefore, controlling the bloom of these bacteria during episodes of inflammation is preferable to removing them from the system completely." Although experimental evidence is scarce, it has long been speculated that changes in the gut microbiota composition can worsen disease, Dr. Winter said. 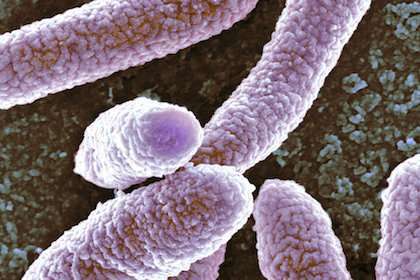 In this study, tungstate treatment in mouse models of colitis shifted gut microbiota to a more normal state in terms of the balance of bacterial species and also reduced gut inflammation, the researchers report. Tungstate treatment did not cure the disease, but it improved the overall health of the animals. "We only used tungsten in 'proof-of-concept' experiments to identify a potential molecular target, and we are still far from turning this basic discovery into a therapeutic treatment in patients," Dr. Winter said. Exposure to tungsten - a heavy metal - can potentially have serious negative effects, such as neurological and reproductive harm, he added. Traditional therapeutic approaches focus on treating the human host. But these latest results give hope that, in principle, it may be possible to harness normal gut bacteria to achieve a positive outcome for the host, for example by carefully steering the function and composition of the gut microbiota during gut inflammation, Dr. Winter explained. "When doctors use broad-spectrum antibiotics, the goal is to kill off as many bacteria as possible. If a patient shows up in a clinic very ill and there is no time to identify a specific pathogen, broad-spectrum antibiotics will be used," Dr. Winter said. "The effects of broad-spectrum antibiotics on the gut microbiota are devastating. It's like using a torch in a flower bed and hoping that once you kill the weeds, the flowers will flourish. "In our case, we found a way to target only one family of bacteria, the Enterobacteriaceae, and only during inflammation," he said. "More study is needed to find potential therapies for human disease, but this is a promising first step."